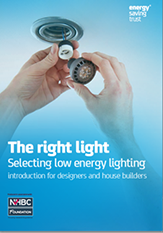 This practical guide for house builders and designers is an introduction to the selection of low energy lamps. It compares the categories of low energy lamps and sets out the considerations important in the selection of LED lamps, which offer increasingly efficient and economic lighting solutions. Also included are recommendations for lighting levels for different rooms in the home. The project was supported by the NHBC Foundation and the guide prepared and published by the Energy Saving Trust (EST). The EST has published a blog on this new guide. Historical view – emergence and development of LED lighting technology. European perspective: explanation of energy ratings for lamps and their comparative energy use. Phased out ratings and new ratings. Energy efficient lamps compared with the performance of outdated tungsten incandescent lamps. UK perspective. Low energy lighting compliance with Building Regulations Approved Document L1A (England) 2013. Best practice low energy lighting. Safety notes for downlighters. Compares the characteristics and performance of main lamp types available today: halogen incandescent, linear fluorescent (LFL), compact fluorescent (CFL), light emitting diode (LED). Includes cost comparison for individual lamps and for the lighting of a typical home. Sets out an overall 3-level approach: background, task and accent lighting. Includes lighting guidance for lounges, dining rooms, bedrooms, kitchens, bathrooms, home offices, halls and stairs.